ProClass is easy-to-use, scalable and customizable software to effectively and efficiently manage schools, online registrations and memberships. It aims to strike a good balance between affordability, security, features and helps increase registrations and memberships. It suits a variety of institutions, including schools, art centers, dance schools, franchises, gyms, hospitals and healthcare providers, non-profit organizations, Churches and religious organizations, Sports/summer camps and more. It helps organizations in enhancing their customer support and build better relationships with students, members and constituents. The solution provides a comprehensive cloud-based platform to better cope with today’s challenges and help manage processes and operations more efficiently and easily. The solution is also committed to providing top-notch security, giving customers’ full confidence to transact online, knowing that their transactions are protected from security threats. ProClass is a comprehensive suite of features and modules to help organizations effectively manage their daily operations using a secure and fully integrated web-based system. 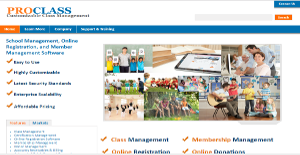 The software particularly suits schools, studios and membership organizations and offers greater flexibility and customization options, including unlimited users, classes/events, registrations, user defined fields, SMS/e-mails and support. Its Class Management features allow flexible scheduling, efficient capacity management, online registrations, integrated membership management and more. It provides a secure audit trail and allows efficient management of financial transactions and customer billing, resulting in better cash flows. Attendance for classes/events can also be taken easily, while makeups can be scheduled for missed events with click of a button. Future sessions can be updated with advance notification of planned absences. Software’s automated batch payment processing features enable organizations to collect payments more efficiently and quickly, reducing credit card processing fees and hassles related to payment collection. The software is able to handle all variables relating to class scheduling and allows mixing recurring schedules with specific locations, rooms, times, meet dates and more. The software also includes certification management features for organizations that need to manage student/attendee progress. It can even help track and manage certificates obtained from organizations other than your own. The customer and donor management features allow building stronger relationships with clients/donors and helps track interactions, helping organizations provide better services. If you are interested in ProClass it may also be a good idea to check out other subcategories of Best Club Management Software listed in our base of SaaS software reviews. Every company has different requirements and needs an application that can be customized for their size, type of employees and customers, and the particular industry they are in. For these reasons, no software can proffer perfect functionality out-of-the-box. When you try to find a software system, first be sure what you need it for. Read some ProClass reviews and ask yourself do you need basic tools or do you need advanced functionality? Are there any industry-specific features that you are seeking? Get the answers to these queries to aid your search. There are multiple elements that you need to mull over and these include your finances, specific business wants, your organization size, integration needs etc. Take your time, check out a few free trials, and finally choose the system that provides all that you want to enhance your organization efficiency and productivity. ProClass is a quote-priced system, meaning that each client receives an individual SMB/enterprise pricing plan tailored to his needs. Contact the company for more details, and ask for your quote. We realize that when you make a decision to buy Club Management Software it’s important not only to see how experts evaluate it in their reviews, but also to find out if the real people and companies that buy it are actually satisfied with the product. That’s why we’ve created our behavior-based Customer Satisfaction Algorithm™ that gathers customer reviews, comments and ProClass reviews across a wide range of social media sites. The data is then presented in an easy to digest form showing how many people had positive and negative experience with ProClass. With that information at hand you should be equipped to make an informed buying decision that you won’t regret. What are ProClass pricing details? What integrations are available for ProClass? For the moment, ProClass offers a streamlined and flawless integration with Facebook. If you need more information about ProClass or you simply have a question let us know what you need and we’ll forward your request directly to the vendor.